The LeapFrog Leapster 2 is a cool little learning device that allows you to get online to the LeapFrog Learning Path so you can see what your kids are learning. It also allows your kids to connect online so they can get extra rewards and activities. With this smart handheld system, children learn valuable school skills through a variety of animated games and activities. Kids use the interactive touch screen and stylus throughout 30 educational games featuring characters they love. The Leapster2 System also offers several options for creative play. Little learners can easily connect online for extra activities and rewards. And best of all, parents can use the Leapster2 to connect to the LeapFrog Learning Path, an online, interactive tool in which parents can get updates and see firsthand what their children are learning. Leapster2 System comes with built-in starter games; additional software sold separately. Requires 4 "AA" batteries, not included. Measures 13"W x 10.5"H.
The preschool gaming handheld that connects to the LeapFrog® Learning Path, an online experience that lets you see what your child is learning. Play and learn school skills on the go or connect online for extra activities and rewards. Library of over 30 exciting learning games featuring characters kids love. Included and additional games teach skills in a range of subjects, such as language arts, reading, mathematics and science. Parents can connect online to the LeapFrog® Learning Path to see what their child is learning. Kids connect online for extra activities and rewards. 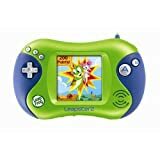 LeapFrog Leapster 2 Learning Game System - Green 3.7 out of 5 based on 565 ratings.